The word rempah always crops up in a recipe whenever you try to make a nyonya dish. What is rempah? Literally, the word means "spice" in Malay. 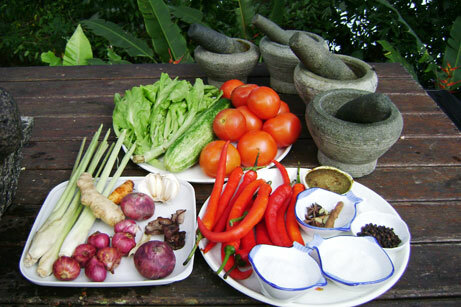 In nyonya cuisine context, it refers to a blend of fresh spices which are ground together. In the old days, those spices are ground manually. Now we can use our electrical gadgets to make rempah. Or, for convenience sake, buy ready-made rempah in packets. I had the honor of taking a peek at a recipe in Chef Wan's collection. Laksa Peranakan Bibik Neoh has a list of ingredients a a mile long! Watch the video of Chef Wan making the laksa at the end of this page. Onion/shallot, with ginger and garlic. Onion/shallot, ginger, garlic and chilies (fresh or dried chilies). All of the above plus galangal, fresh turmeric, lemongrass and cekur (sand ginger). Candlenut is also a typical rempah ingredient in nyonya cuisine. the ingredients will make up a nice mix of rempah. These mix are usually prepared just before cooking. For most organized cooks, they like to blend the rempah in advance and store them in little containers in the fridge, ready to be used. If you cook rempah with vegetable oil, over slow fire, you can store it longer, or even freeze it. From my observation and experience, cooked rempah is sometimes referred to as sambal by Malay cooks. Describing sambal is another matter altogether. Sambal ingredients must always have chilies in it. It can be eaten raw, prepared from fresh chilies, sambal belachan is a good example. 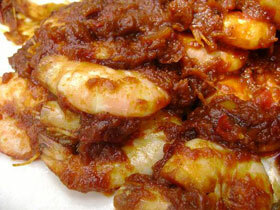 Cooked sambal usually is referred as sambal tumis. This is prawns cooked in sambal tumis. In short, we can conclude that we make rempah mix to cook sambal. My students, who are mostly from abroad always ask me these questions. So I hope my write-up on this page would shed some light on the lingo of Nyonya and Malay cuisines. The short clip below shows how the rempah is cooked to make the gravy for Peranakan Laksa and then a dollop of ready-made sambal is used as garnish and add an extra oomph to the already fantastic dish! Now, let's watch how Chef Wan used rempah in nyonya cooking to make Nyonya laksa.